I find Men without a shadow of a doubt so much harder to buy for, which makes life hard because I am a boy mum and 90% of my family is men. I'm sure I'm not alone in this, so I've tried to come up with some gifts that I think any kind of man would like, I've not gone for a specific genre, just quite general as although I know John is a computer nerd, and my own Dad loves Aston Villa, I'm sure those things wont really fit in with most of the males in your lives (especially the Aston Villa - sorry Dad). 1. Personalised Keyring - I thought this is such an adorable idea for new dads, it's classy and elegant which is hard to find in a keyring they're normally pretty gimmicky. You can have whatever date your other half became a father printed, with 'Dad', 'Daddy' or whichever words you use in your household etched onto the wood. A perfect present to Dad from the littles. 2. Chocolate - What human doesn't like chocolate? Therefore, Dads gonna love chocolate. John for some bizarre reason prefers Galaxy over Dairy Milk, so I know he'd love this set. It's a little smarter than just giving him a selection box, and more up his street than a box of fancy chocolates. A certain winner under the tree in my eyes. 3. Canvas Print - These prints are unbelievable quality, I was kindly gifted one a couple of weeks ago, where I chose my own print of the boys. I'm not going to spoil someones Christmas surprise by showing it on here just yet, but it's honestly incredibly beautiful, so much so I'm buying another two. I think for grandparents it would be such a priceless gift to have one of their grandchildren, it's a gift no one else can give and one they can treasure forever. 4.Dad Book - These Ladybird books are amazing, if you haven't seen any of them you really must. A giant piss take of what Dads deal with, I myself was given the Mum one for mothers day so it's only right I give him a little laugh back right? 5. A tipple - I'd never heard of Espensen Spirit before till they kindly gifted me some of their range and I was so surprised at just how fab their stuff is. I've managed to stuff a few of these into Johns stocking as they're perfect for the party season, with some slightly different flavours such as 'Rhubarb and Custard Vodka', so unique and great stocking fillers. 6. Mr & Mrs - One of those 'gifts to you for both of us' kind of gifts. To be honest it's asking for trouble isn't it, but the Mr & Mrs game looks so much fun, and as I'm sure ITV aren't going to be inviting us to the studios any time soon. I think this would be fab for the festive season. 7.Work Bag - When I saw this bag I fell in love with it myself. It's very sophisticated and great for the office guy. It's real leather and incredibly sleek, perfect for popping in any man-ssentials, such as Ipads, phones, headphones - all that kind of stuff. I don't know any business man that wouldn't be pleased unwrapping that this year. 8. Shoe Care Kit - Another for the office type, and something I'm shocked John doesn't own. He has little polish tins scattered here and there, but I think one kit to keep everything in place is exactly what he needs! 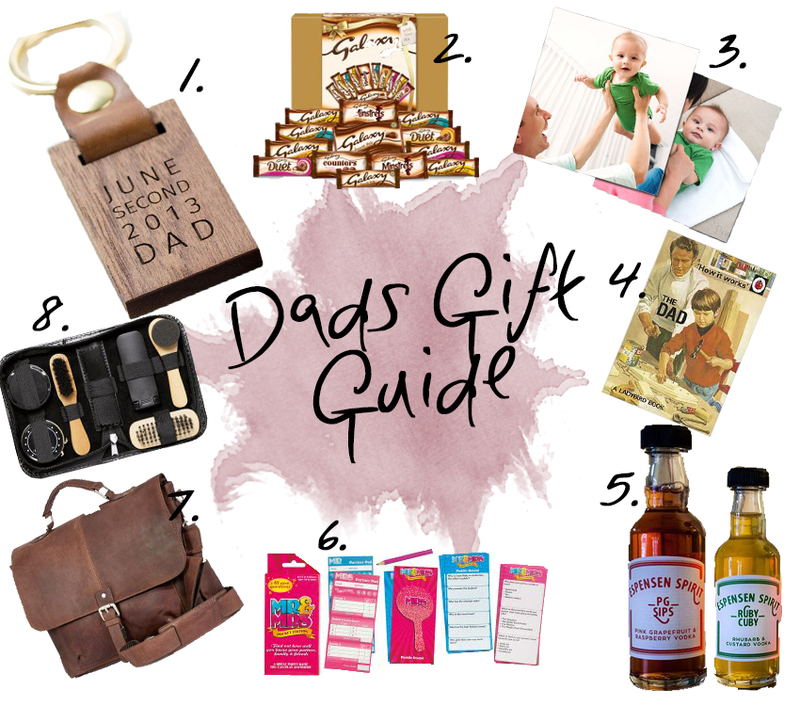 What gifts do you plan to get the men in your life this year? Don't forget to check out my other gift guides.